We opted for a "rural hotel," and decided on the Hotel Rural Casa Viscondes da Várzea near Lamego for our stay in the valley. The hotel, which was within a drive of an hour or so of the quintas we planned to visit, turned out to be ideal both in terms of location and the excellence of the accommodations. The portion of the hotel in which we stayed is "ancient" by Western standards, having been built in 1802. The main building houses the dining room and additional bedrooms, and dates from the mid-19th century. Regardless of its age, the entire hotel is comfortably appointed and sited amidst over 180 hectares of vineyards and farmland. We later learned from our gracious hostess and hotel's owner, Maria Manuel Cyrne, that the grapes from the vineyards on the property are sourced to a winery that was on our list to visit. There are some 80 varietals of wine grapes in the Douro Valley, but among the most important are Touriga Nacional, Tionta Roriz, Touriga Francesca, Tina Barroca, and Tino Cão for reds - the so-called "top cinco" - and Rabigato, Gouveio, Viosinho, and Malvasia Fina for whites. Although there are some vineyards planted with a single varietal, many others are mixtures of them. 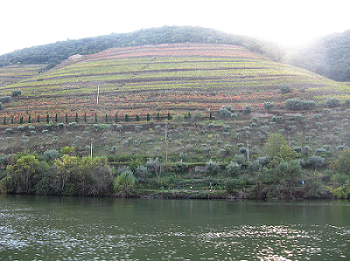 Indeed the unique nature of Douro wines is often attributed to the diversity of varietals contained in the vineyards. We first met with Sónia Pereiera at Quinta Nova de Nossa Senhora do Carmo, one of the oldest and largest quintas in the Douro. Our second conversation was with Francisca van Zeller at Quinta Vale D. Maria, together with Maria Manuel Maia from Poças Júnior, both of whom are members of D'Uva (see below). This was followed by visits with Maria Serpa Pimentel at Quinta da Pacheca, one of the first woman winemakers in the Douro, and with Luísa Borges at Vieira de Sousa who was quite recently appointed winemaker at her family's winery. We next talked with with Sandra Tavares da Silva of Wine & Soul, a winery she owns with her spouse, also a winemaker. We concluded a very busy week with a visit to Murganheira, a wine cellar mainly focused on sparkling wines, where we met with Marta Lourenço. Ready for a change, Sónia came to Quinta Nova in the fall of 2010 to help with harvest. On the last day of harvest she was offered and accepted a job as a cellar worker, a position not usually held by women. In a few short years she worked her way up to being the enologist/winemaker at the winery. In this role, she works closely with Jorge Alves, the lead winemaker. Sonia views Jorge "as the best winemaker in Portugal at this time" and describes him "like a private teacher." She could not be happier. As a measure of her commitment and dedication as a winemaker, she is the first to arrive at the winery each day and the last to go home. Winemaking was not an intentional career path for Sónia, however. She grew up on a small family farm, and although her parents made wine for personal enjoyment, she "was not a fan of wine." Her then boyfriend, and now husband - they married in 2005 - enrolled at the Universidade de Trás-os-Montes e Alto Douro (UTAD) in Vila Real in 1998, the only university in the area that offers an enology degree. Sónia, who was at the point of considering her own educational path, decided to attend the same university the next year. She took a number of jobs in wineries to support herself while in school and found that she loved working in the cellar and doing harvest. Most importantly, she discovered her love for wine. She completed her degree in 2004 and immediately accepted a position at a small winery where she worked until 2010 and "did everything." Sónia is respected by her colleagues and held with great affection, as we saw first hand when Tiago Silva, hospitality manager, joined our lively conversation. Sónia is personable but also focused and precise. When we asked what she most loved about her work, she replied that "all things are connected, it is different every day and never boring." She likes challenges and sees problems "as something to be solved." "Everything has a solution except when the wine ends up on the floor!" When asked specifically what is needed to be successful, Sónia indicated that the situation is improving for women in Portugal, but that women still need to prove themselves more than do men. "Today it is not enough to have a family name, you have to be able to do the work." Sónia's spouse also works at Quinta Nova, and their daughter Joana spends many happy hours at the winery. She noted that younger men like her husband - those under age 45 - know they need to work at home and do their fair share. "Working women have different expectations." The highlights of Sónia's career thus far are the birth of her daughter in 2008 and crafting the Mirabilis Grande Reserva White wine together with Jorge Alves. The Mirabilis Grande Reserva White 2015 is the first Portuguese white wine to enter the distinctive list of the best wines in the world. This complex and intense wine earned 94 - 96 points from the prestigious critic, Robert Parker. We continued our lively conversation in the lovely tasting room where we treated to an impressive tasting of six Quinta Nova wines, all delectable. Starting with two white wines, the 2015 Pomares and 2015 Grainha Reserva, we moved on to three reds, the 2014 Unoaked, 2013 Grande Reserva, and 2014 Grainha Reserva, and finally to the Clã Special Reserve Porto. Regrettably, we needed to leave the wonderful tasting sooner than we would have liked. It was getting close to 6 p.m. and quite dark outside. Yes, we were nervous about the drive down the mountain in the pitch dark. Sónia sensing this, offered to lead the way. And she did, at breakneck speed! 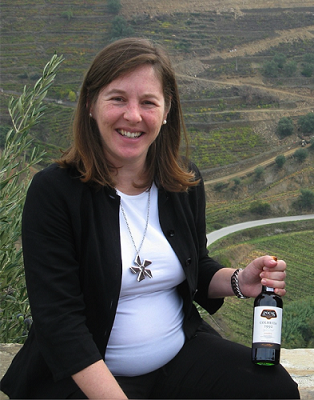 Francisca van Zeller is from a Portuguese wine family with deep roots in the Douro Valley. Her father, Cristiano van Zeller, is a well-known and highly successful wine producer whose family had owned and operated Quinta do Noval since 1894 before it changed hands in the 1990s. (Her father was co-administrator of Quinta do Noval in the 1980's and 1990's). Quinta Vale D. Maria, which was acquired by her parents in 1996, had been in her mother's family for over 250 years. Subsequently, her father named one of the new vineyards he planted "Francisca," in hindsight perhaps with the hope that his passion would lead her to a career with the winery. Very much a visionary, doer, and ambassador, Francisca is heavily involved in developing and implementing the marketing and distribution strategies for the Quinta. 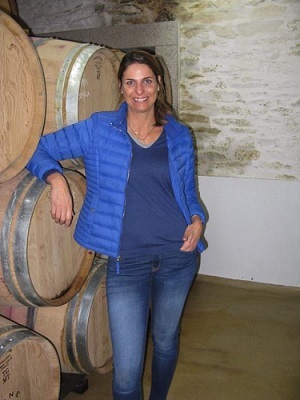 She manages the winery's relationships with journalists and clients directly, but also through the " Douro Boys" group and the more recently formed "D'Uva - Portugal Wine Girls," of which she is a founder. In addition, she is involved in the Quinta's winemaking process, especially in the final definition of the wines. During our conversation, Francisca talked extensively and with great passion about the plans for further developing Quinta Vale D. Maria wines and refurbishing some of the centuries-old buildings on the property. The Douro Boys are associated with what some call "The New Douro" and its focus on the excellent still wines now being produced in the Douro Valley. In the past five years, both still wines and Ports from the Douro were listed Wine Spectator's Top 100 Wines. The Douro Boys, with representatives from a group of five wine estates, Quinta do Vallado, Niepoort, Quinta do Crasto, Quinta Vale D. Maria and Quinta do Vale Meão, has as its goal positioning the still wines of the Douro on an equal footing with the traditional Port wines. Francisca's father, Cristiano van Zeller, was one of the group's organizers. The members of D'Uva are well known professional women from different regions of Portugal, and include leading winemakers, viticulturists, owners, and marketing and sales managers. Among its goals is promoting Portuguese wines throughout the world. 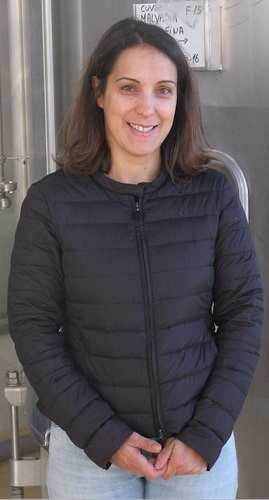 Francisca noted that winemakers such as Filipa Pato in the Bairrada wine region and Sandra Tavares da Silvia (see below) have done well in the industry, and their recognition helps younger women seeking winery positions. She thought that in sales, "Being a daughter of a recognized family in the wine business may be an advantage, as it is still a rarer case than being a son who has gone into the business. It can attract attention just because of the gender difference." Overall, though, in her experience, marketing and trade appear to be more balanced between women and men than other areas of the wine industry. She observed some specific disadvantages for women - sommeliers are still mainly men and they don't seem to include female sommeliers in their events (there are relatively few female sommeliers in Portugal). Similarly, few tasting circles include women, and members of the circles typically do not invite women to join them. In addition, only rarely does one see women as wine buyers. In the area of viticulture, both Francisca and Maria Manuel Maia, a viticulturist (see below), thought that the change in Maria's field was slower than in winemaking, and that it was "still a man's world." Quinta Vale D. Maria produces award-winning Vale D. Maria Whites, Reds, Port and CV (Curriculum Vitae Douro Red), the estate red. The 2009 red "Tinto" Quinta Vale D. Maria Douro received 96 points from Parker. And just recently, the Quinta Vale D. Maria Douro Red 2013 made it to the "TOP 100 Wine Spectator List of 2016". Francisca surprised us with a gift bottle of the 2013 Quinta Vale D. Maria "Vinha da Francisca" Douro Red made from fruit grown in the vineyard bearing her name. Similar to Francisca, these deep family roots were central to Maria's deciding on her career path. From an early age, she knew she was passionate about sustainability and "working outside." She studied Agricultural Engineering at the Universidade de Trás-os-Montes e Alto Douro. During her studies at the university, she "became aware of how proud I would be if I could work in the field that my ancestors had handed down to me." Upon graduating in January 2005, Maria decided to take her internship in Italy, after her teacher presented her with that option. This internship turned out to be crucial step in her career - she learned that doing research was too far removed from her passion, working outside "in the natural world." Coincidentally, the person who was the viticulturist with the family estates left for another opportunity that year, and Maria was offered the position of viticulturist. She accepted the offer in late 2005, less than a year after receiving her degree. Maria noted that when you work in a family company, you know you have to produce results. "You do not worry about having weekends." She married in 2016, and she and her spouse are expecting their first child in 2017. With this upcoming addition to their family and despite her many responsibilities at the quintas, she feels confident that she and her spouse will be successful in managing the changes that the arrival of the baby will bring to their lives. Her husband, a lover of Port wine, is flexible, social, and open to embracing the changes and complexities that accompany family life with a viticulturist! "Never be distracted from the important parts of your life." Maria's grandfather was well known in the Douro, where he had established wineries and served as president of the Port Wine Institute until 1976. In 1973, he started to bottle Douro still white wines, namely, Riesling and Gewurztraminer, which he gave to friends. Their positive responses to the wines led to his creating the brand name "Pacheca," and marketing the wines. In the 1980s, he started producing still red wines under the Quinta da Pacheca label, and in 2000, the year he died, he produced his first Port Vintage wines under the Pacheca label. In recognition of her expertise, Maria was nominated for and now serves on one of the boards of the Instituto dos Vinhos do Douro e Porto (Port and Douro Wine Institute), She coordinates the board that assesses Port wine samples and assigns their designations. She is the sole woman on the board. According to its web site, "The mission of the institute is to promote the control of the quality and quantity of Port wines, regulating the production process, as well as the protection and defense of the Douro and Porto denominations of origin." Maria finds serving on this board challenging and important. 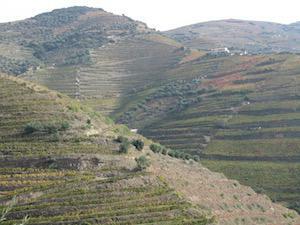 She noted that the Douro might be the most controlled wine region in the world, especially with regard to Port wines. Maria has two children, a son age 20 and studying law, and a daughter age 16 and in high school. Both were born early in her career. When asked about balancing career and family demands, she emphasized the importance of knowing one's priorities in making difficult decisions that inevitably arise. She spoke eloquently about the importance of moving on after making important decisions and "thinking that every day is going to be the best day." When we asked what it was like to be one of the very few women working in the cellar, she responded that: "In the beginning it was not easy. My ability in traditional male areas was constantly questioned. They asked, for example, 'Can she climb the stainless steel vats?'" She believes that things are quite different today. "All winemakers try to show the terroir in their wines. Today, women have the same opportunities." In her class of 15 students at UTAD, eight were women, five of whom are working in some aspect of winemaking. She did mention one area of annoyance, however - describing her wines as "feminine" solely because she is a female winemaker! When we asked Luísa Borges, the Oenologist at Vieira de Sousa, what led her to work in the wine industry, without hesitation she responded, "the decision was natural." 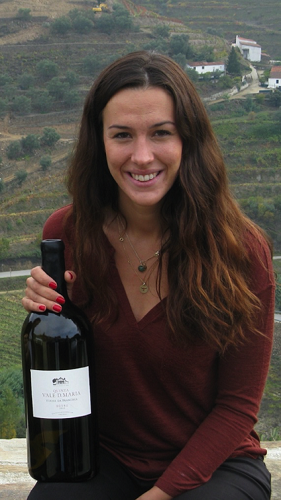 Luísa, who was recently nominated for the category of "Young Female Winemaker" in Portugal, grew up in the world of Port, although she lived in Lisbon rather than Porto. Her father, António Borges, was raised in the Douro village of in Celeirós , and his family on his mother's side (Vieira de Sousa) was involved in growing and supplying grapes to prominent shippers of Port. In 2008, when Luísa was 23 years old, her parents unexpectedly experienced a "crisis period." Because selling bulk wine was no longer profitable, the family began crafting its own wines and building their own brand, Viera de Sousa. 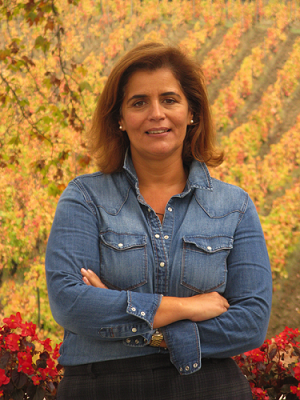 Luísa moved to the family home in Celeirós (Sabrosa) and became the winemaker and marketer for her family's wines. That same year, she produced her first Port, Vieira de Sousa LBV 2008, which the family started selling in 2011. 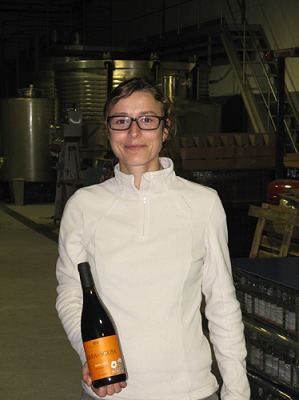 Luísa has not found it difficult to be a winemaker as a woman. She believes "that one does not need to take an aggressive stand to be taken seriously." She knows she is the boss and is clear about the quality of work she expects. She thinks she may have learned a valuable lesson when she was put on the night shift in her first position at a winery. She did not flinch and carried on as if it was usual for the petite young woman that she is to be given that assignment. Having a network of colleagues, including a mentor with whom she worked earlier, has been very helpful. 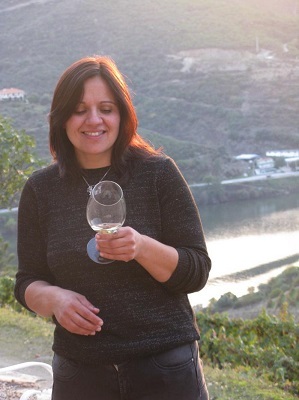 In Luísa's experience, the Douro is more open than other regions of Portugal to hiring women as winemakers. She thinks the percentage may be as high as 30% women as lead winemakers. When working with Port, she noted that employers "may look to work with men more than women because of the very large barrels that are used." However, she has noticed more young people and new projects that include women. In general she finds people quite open to discussing problems and sharing information. All Viera de Sousa wines are made with estate-grown grapes. Approximately 50,000 bottles are currently produced from their different quintas, all of which are situated along the Douro River. Although both still and Port wines are being produced, Luísa's plan is to "always do more Port than still wine." She crafted the first Viera de Sousa table wine in 2011, and this line has been expanded to include a Tinto Reserva and Grand Reserva, Branco Reserva, and a new pair of wines they are launching, Alice Vieira de Sousa White 2015 and Red Reserva 2013. The winery's Ports include a range of White, Tawny, and Ruby Ports. In 2013, Vieira de Sousa Ports were included in a blind test of 56 brands in Porto, as part of a world-wide presentation of the extraordinary vintage of 2011. Vieira de Sousa, a new brand at the time, was among the nine Ports rated in the range of 98 - 100 points. More recently, their Porto and Douro wines were featured in the November 2016 issue of "Revista de Vinhos," a well-regarded Portuguese wine magazine. "Wine is like sharing, it is for our future, for our children." Sandra Tavares da Silva, named as Portugal's "Wine Entrepreneur of the Year" in 2013, appears to be in constant motion! She is the winemaker for Wine & Soul, which she owns with her husband, Jorge Serôdio Borges, and for Quinta de Chocapalha, her family's winery near Alenquer, which is northwest of Lisbon. In addition, until recently she was the winemaker and then consulting winemaker for the award-winning Quinta Vale D. Maria. We met with Sandra at the Wine & Soul winery in Vale de Mendiz, the day after her return from an extensive U.S. trip to promote Douro wines. We were greeted warmly by Sandra and her three lovely children, a son and daughter aged 6 (twins) and a son age 10. As we talked, the children played happily, running among the fermenters, lagarde, and barrels, quite at home in the winery. In 2001, she became involved in a third project, this time with her husband, whom she had married that year. They shared the same dream of creating a winery that would showcase the traditional varietals of the Douro Valley. She spoke with great passion about the meaning behind the name of their winery - "warm and personal wines that symbolize our life." 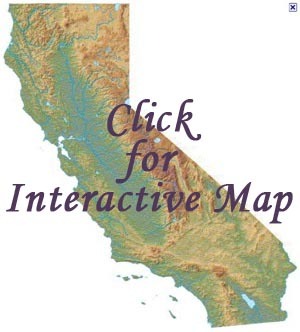 Their goal is to "create wines with their own identity where vineyards have a decisive role." Each wine of Wine & Soul is associated with a single vineyard, and its identity is maintained year after year. She also shared with us some of their exciting future plans, one of which is installing a tasting room in the same building as the winery. The tasting room would offer views of their spectacular steeply terraced vineyards. When Sandra started as a winemaker in the late 1990s, she was one of the very few women in the field. It was not easy for her at the beginning. She said that she clearly had to prove herself - "let's see what this girl can make?" She thinks this is much less the case today, particularly in smaller wineries that also have an interest in still wines as compared to large Port houses that are more traditional in their views. Currently her two assistant winemakers are both women. When asked what is needed to be a successful winemaker, Sandra smiled and said, "my father's personality - focused and persistent." To this, she added passion, being knowledgeable about what is a good product, willingness to work hard, vision, and attention to detail. Marta's dream was to become an occupational therapist. After volunteering in this field for a few years in schools, she decided it was not a good fit. She instead turned her considerable talents and energy to engineering and agronomy, and the study of food production at the Agrarian School of Santarém. She well recalls the life-changing conversation with a teacher in her program who suggested she do a harvest: "Why do vegetables? You have the talent for wine." She recalls saying in response, "I grew up in the small mountain village of Alqueve. I do not know wine!" Marta trusted the advice of her teacher, whom she admired, and worked two harvests. This led to her decision to study in Spain for a year to get a broader experience with wine. Her father, who had always given her room to do what she wanted to do and trusted her judgment, was supportive of this decision. When she returned in 2008, Marta accepted a position as assistant winemaker at Murganheira. That same year she and her boyfriend of three years married. They now have two children, ages 6 and 3. He is "a big-hearted husband" who does his fair share at home. He also works at the winery. Marta said that it was very hard at the beginning. "It was clear that the men did not want me here." Marta coped by pretending that the comments and negative attitude did not bother her. Although she acted as if she was letting the comments roll off her back, it was a painful time. She felt more of a negative attitude here than in Spain or when she was in school, and attributed this difference to being in the north of Portugal where customs are more traditional. An important source of support and learning for Marta comes from other young winemakers in the Douro. Once a month, the group meets to have dinner and taste each other's wine, with each person showing up with two bottles of wine. Marta finds the experience "amazing" and loves the camaraderie and feedback. Following the tour we moved to the handsome modern tasting room, built in 2008, and enjoyed several excellent sparkling and still wines there. These included our favorite, the delicious Murganheir 2007 Vintage Bruto, which received a gold medal in 2015 for this vintage, the 2013 Unico Bruto and 2008 Chardonnay Bruto made from grapes sourced from the Hotel Rural Casa Viscondes da Várzea where we were staying, and the Tapada do Chaves 2010 Reserva Tinto, made from fruit from the oldest vineyards in Portugal. To our pleasant surprise, Marta then sent us home with several gift bottles of sparkling wines! We believe that sharing the inspiring stories of these successful women winemakers and a viticulturist in "The New Douro" will further facilitate the process of change that clearly is underway. Wine regions experiencing growth generally provide increased opportunities for women than more established regions because more positions are available for which they can apply. Nonetheless, as Sónia Pereiera and Marta Lourenço reminded us, women who successfully compete for these positions still need to prove themselves. They and others with whom we talked believe this more conventional attitude is slowly changing, particularly in smaller wineries that have an interest in crafting still wines and are less bound by traditional practices. 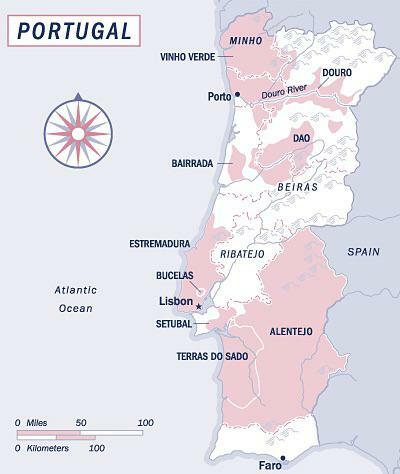 The headwaters of the Douro are in northwestern Spain and the mouth is at Oporto (Porto), Portugal. At over 550 miles in length, the river has carved a deep valley throughout its course in Portugal. It is on this challenging steep terrain that wine grape growers have managed to carve out vineyards that spill down the hills to the edge of the river. As seen in the photo to the right, this has been accomplished by constructing terraces that run perpendicular to the slope of the land. This minimizes erosion of the vineyard's soil. 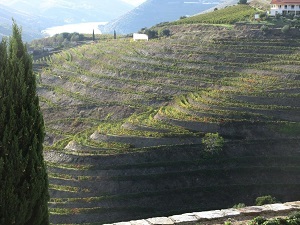 As an aside, it is illegal to plant rows of vines parallel to the slope unless the angle is less than 35° to 40°; the fact that this is seen only rarely in the valley reflects the steepness of the terrain. 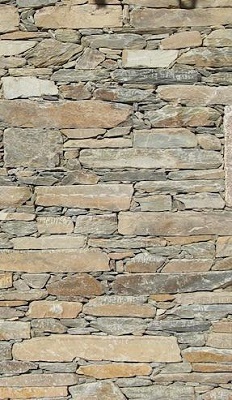 Each terrace is typically less than four meters wide and is supported by a "dry-built" stone wall, that is, one constructed without the use of mortar. The Portuguese are truly experts at this laborious and exacting mode of construction (see photo on left). Each terrace has only one to three rows of vines planted on it, the result being that nearly all viticulture activities must be performed manually rather than mechanically. Moreover, what passes for "soil" makes one wonder how the vines themselves manage to survive. 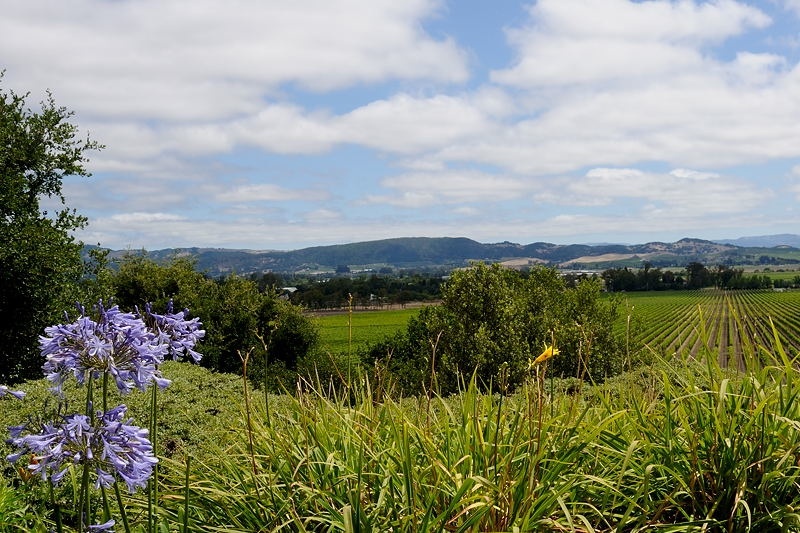 In much of the valley, they are planted in soil that is largely composed of schist, a nutrient-rich, slate-like metamorphic rock, although some areas feature granitic soils. Fortunately, the schist, which is highly fractured, has many interstices that retain moisture, and it is this property that allows the vines to prosper during the hot, arid summers that characterize the valley's climate when highs can reach 113 °F (45 °C)! Content for this article came from our conversations with the winemakers and information they provided us about their wineries and their wine region.